The second-densest metal and one of the hardest elements to find on Earth, Iridium, could be instrumental in tackling cancer. The elements landed in the Gulf of Mexico 66 million years ago, the researchers explained, on the meteorite that eventually caused the extinction of dinosaurs. The Warwick group combined Iridium to the blood protein Albumin, which then was blasted with light, which allowed the researchers to track its passage into cancer cells, where it converted the cells' own oxygen to a lethal form which killed them. 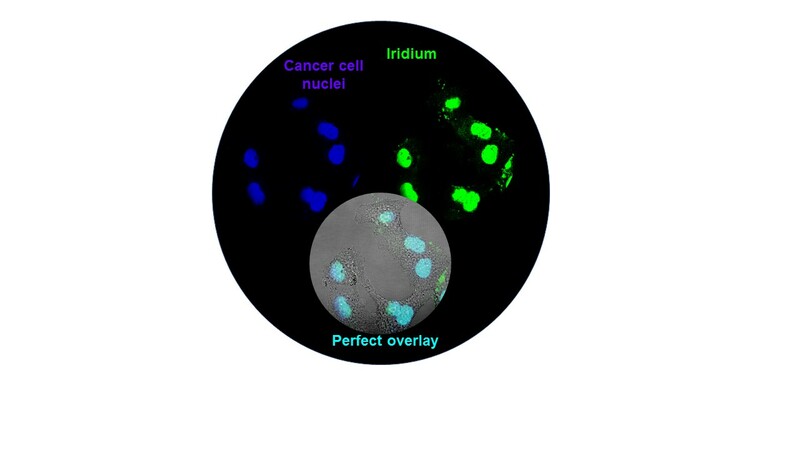 "It is amazing that this large protein can penetrate into cancer cells and deliver iridium which can kill them selectively on activation with visible light. If this technology can be translated into the clinic, it might be effective against resistant cancers and reduce the side effects of chemotherapy," Professor Peter Sadler, from the Department of Chemistry at the University of Warwick said. Photodynamic therapy — treatment of cancer with light — uses the chemical compounds Nuclei Overlap photosensitizers. Clinicians can selectively 'turn them on' by light to produce oxidising species, which can kill cancer cells and leaving healthy cells intact. In the combination of Iridium and Albumin, the latter is the compound to the nucleus inside cancer cells. Then it is the clinicians' role to switch on the light irradiation in order to launch the process from the cell's very centre. "It is fascinating how albumin can deliver our photosensitiser so specifically to the nucleus. We are at a very early stage, but we are looking forward to see where the preclinical development of this new compound can lead. Our team is not only extremely multidisciplinary, including biologists, chemists and pharmacists, but also highly international, including young researchers from China, India and Italy supported by Royal Society Newton and Sir Henry Wellcome Fellowships," Dr Cinzia Imberti, from the University of Warwick, said. The rare element that could be key to fighting cancer had spelled doom for dinosaurs during the Mesozoic era, when an asteroid carrying it slammed into Earth with an explosive yield that wiped out 80 percent of life on Earth.